The Lexmark MX810de MFP with a customizable e-Task touch screen, 500-sheet offset stacker, 1,200-sheet standard input, 1GB of standard memory and 160+GB hard disk provides print, copy, fax, email and scan functions. The Lexmark MX810dme MFP with a customizable e-Task touch screen, 4-bin mailbox, 1,200-sheet standard input, 1GB of standard memory and 160+GB hard disk provides print, copy, fax, scan and email functions. The Lexmark MX810dte MFP with a customizable e-Task touch screen, 500-sheet offset stacker, 1,750-sheet standard input, 1GB of standard memory and 160+GB hard disk provides print, copy, fax, scan and email functions. The Lexmark MX810dtme MFP with a customizable e-Task touch screen, 4-bin mailbox, 1,750-sheet standard input, 1GB of standard memory and 160+GB hard disk provides print, copy, fax, email and scan functions. Leasing Available from $79.75 per month! Leasing Available from $86.64 per month! Leasing Available from $98.09 per month! Leasing Available from $92.34 per month! The Lexmark MX810dxe MFP with a customizable e-Task touch screen, 500-sheet offset stacker, 2,750-sheet standard input, 1GB of standard memory and 160+GB hard disk provides print, copy, fax, scan and email functions. 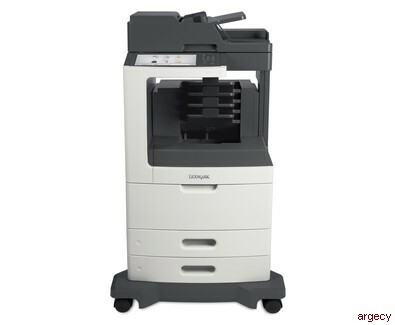 The Lexmark MX810dpe MFP with a customizable e-Task touch screen, hole punch, 1,200-sheet standard input, 1GB of standard memory and 160+GB hard disk provides print, copy, fax, scan and email functions. The Lexmark MX810dxme MFP with a customizable e-Task touch screen, staple finisher, 2,750-sheet standard input, 1GB of standard memory and 160+GB hard disk provides print, copy, fax, scan and email functions. The Lexmark MX810dxfe MFP with a customizable e-Task touch screen, staple finisher, 1,750-sheet standard input, 1GB of standard memory and 160+GB hard disk provides print, copy, fax, scan and email functions. The Lexmark MX810dtfe MFP with a customizable e-Task touch screen, staple finisher, 1,750-sheet standard input, 1GB of standard memory and 160+GB hard disk provides print, copy, fax, scan and email functions. The Lexmark MX810dxpe MFP with a customizable e-Task touch screen, staple finisher, hole punch, 2,750-sheet standard input (dxpe) or 1,750-sheet standard input (dtpe), 1GB of standard memory and 160+GB hard disk provides print, copy, fax, scan and email functions. Leasing Available from $96.55 per month! Leasing Available from $95.22 per month! Leasing Available from $98.05 per month! Leasing Available from $106.85 per month! Leasing Available from $101.05 per month! 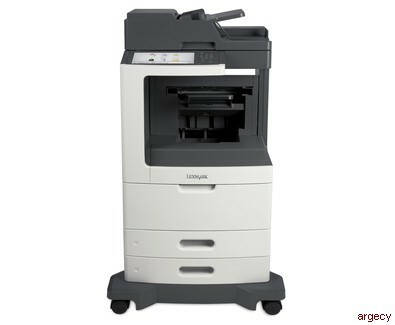 Looking for Lexmark MX810 Parts? Get work done quickly: Enjoy print and copy speeds from 55 to 63 pages per minute, produce your first page in as little as 4.4 seconds and rapidly scan a 2-sided document in a single pass. With a maximum input capacity of up to 2,750 sheets and an extra high yield toner cartridge, you won't have to add paper or change cartridges as often. 48.9 x 26.1 x 28.9 in. 56.77 x 34.25 x 30.0 in. "Recommended Monthly Page Volume" is a range of pages that helps customers evaluate Lexmark;s product offerings based on the average number of pages customers plan to print on the device each month. Lexmark recommends that the number of pages per month be within the stated range for optimum device performance, based on factors including: supplies replacement intervals, paper loading intervals, speed, and typical customer usage.